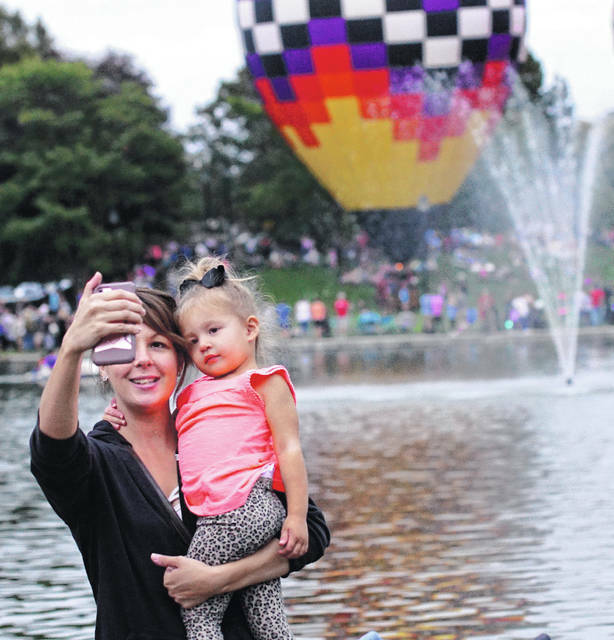 Xenia Community Festival features a balloon glow. 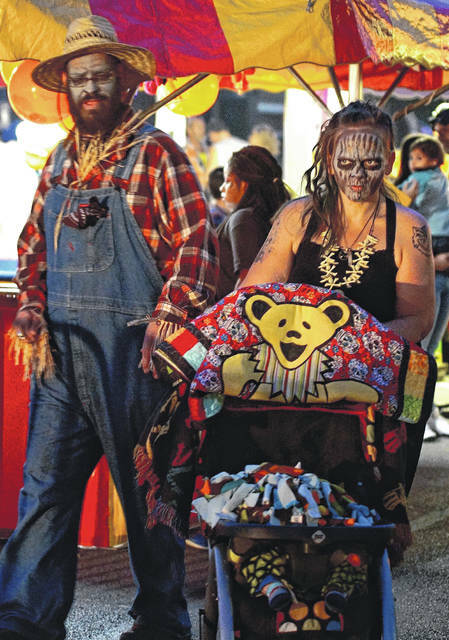 Fairborn’s Halloween Festival attracts gouls and gobblins of all ages. File photos Youth participate in old-fashioned contests during Old Timers Days. Young’s Fall Farm Pumpkin Festival highlights all kinds of pumpkin activities and treats. GREENE COUNTY — It’s not quite fall. But soon, festival season will begin. The 7th annual festival will be held 4-11 p.m. Friday and 10 a.m. to 11 p.m. Saturday in the village. Free festival parking and restrooms are located at Clifton Presbyterian Church. Kids’ activities will include face painting, lawn bowling, a putting green, story time and more. The festival will also feature vendors, a cruise-in, a beer tent, and demonstrations from dance groups and a chainsaw carver. Blue Moon Soup, The Hoppers, Eric Jerardi, Lord Kimbo and more will perform. The annual festival is located at Dayton-Xenia Road, between North Fairfield Road and Meadow Bridge Drive. Saturday hours are 10 a.m. to 8 p.m. with a 5K run/walk at 8:30 a.m. Sunday hours are 11 a.m. to 6 p.m. with car show registration at 9 a.m. The festival will offer more than 200 vendors featuring special services and crafts and of course treats made of — popcorn. Children can enjoy their own special area as well as entertainment slated throughout the weekend. The car show and 5K and kids fun run will begin at Shoup Park, 1341 Meadowbridge Drive. For race registration and more, follow the links at www.beavercreekpopcornfestival.org. Interested persons can still submit vendor and parade applications to Xenia Area Chamber of Commerce for the festival at Shawnee Park. Friday entertainment: 4 p.m. Stan “The Man” Brooks, 6 p.m. Opening Ceremony, 6:15 p.m. Dayton Funk All-Stars, 8 p.m. Balloon Glow. Saturday entertainment: 10 a.m. Dance Loft Plus, 11 a.m. Diamonds & Pearls, 12 p.m. Live Gracefully, 1 p.m. Doug Yates Karate, 2-4 p.m. Karaoke Contest, 5 p.m. Sonic Mojo, 7:30-9 p.m. Alexis Gomez. Jamestown is holding its annual downtown event to raise funds for the community. Beans, cornbread and more will be served. An auction will be held Friday night. Vendors will sell their goods throughout the festival. A parade will be held featuring the queen and her court. Entertainment will include the high school marching band and high school coral group; a band will play Saturday evening. A car show will also be held, along with a new event: kiddie tractor pulls. The festival will end with the drawing of a winning raffle ticket for a $2,500 prize, a ham or a turkey and other prizes. Old Timers Days at the Greene County Fairgrounds features live thrashing and sawmill demonstrations, a petting zoo, tractor and garden tractor pulls, kids games, a hog calling contest and more. Festival-goers can enjoy live entertainment, food, homemade ice cream, arts and crafts and a flea market. The festival begins Thursday at 5 p.m. with opening ceremonies at 6 p.m. Gates are open 8 a.m. to 10 p.m. Friday and Saturday; 8 a.m. to 4 p.m. Sunday. Adult admission is $4. 12 years and younger, free with paid adult. Seniors, $1 on Friday 8 a.m. to 5 p.m. only. Three-day pass, $10. Farm visitors can park their cars across the road in the field and walk over to the dairy for activities. These include Cowvin’s Corny Maze (11 a.m. to 6 p.m.), four cow milking demonstrations (every hour, starting 1 p.m.), pumpkin donut hole making (11 a.m. to 6 p.m.), pumpkin painting (12 p.m. to 5 p.m.), pumpkin launcher (11 a.m. to 6 p.m.) and cheese production tour (12:30 p.m., 2 p.m., 3:30 p.m., 5 p.m. Young’s-goers should be sure to snap a selfie with giant pumpkin Humongus Gus, too. Festival held rain or shine. 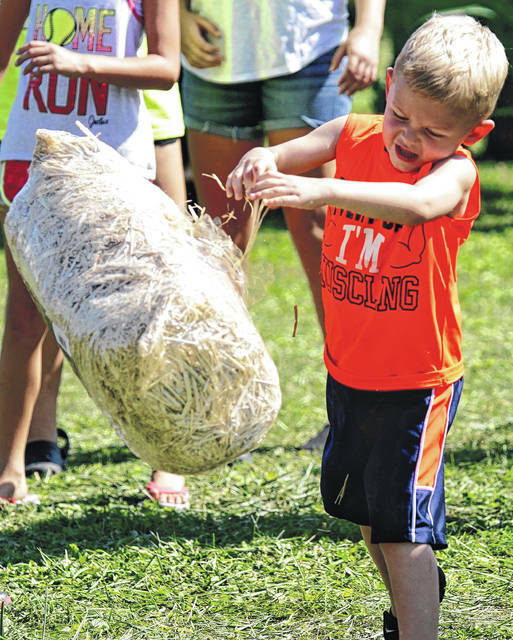 The annual festival held on Main Street in the village will feature all kinds of potato foods, entertainment, arts and crafts vendors, a Tater Trot 5K on Saturday and a pet parade on Sunday. There is no entrance fee for the festival and a small fee for parking. Visitors can register for the 5K at 8 a.m. Saturday at the park (or pre-register). The run will begin at 9 a.m. and will travel along the bike path. Festival hours are 9 a.m. to 9 p.m. on Saturday and 9 a.m. to 6 p.m. on Sunday. Street fair boasts “a day of hoopla,” 65 shops and eateries, and 250 booths full of fine arts and crafts, clothing, jewelry, fair trade items, gifts, massages, international cuisine and more. Entertainment includes Lady Handsome, Marjorie Lee and the Lovers, The Bellowing Pines and Egyptian Breeze. The Midwest-famous sauerkraut festival began as a small local event in 1970. Hours are 9 a.m. to 8 p.m. Saturday and 9 a.m. to 6 p.m. Sunday. Now one of the premier craft festivals in the nation, the Waynesville festival will showcase over 450 vendors with handcrafted items. Arts and crafts range from ceramics to paintings to word-working, while food offerings range from sauerkraut pizza to fudge. Visitors can also enjoy entertainment throughout the weekend. Adults and kids can both enjoy the 7th annual festival downtown on Main Street. The Halloween-themed event will host rides and vendors, along with the Spooktacular Parade Friday night. Costume judging begins at 6 p.m. that night at the YMCA. The parade will begin at 7:30 p.m., down Central to Main Street. Entertainment and contests will be held throughout the day Saturday, with the Zombie Walk beginning at 8:30 p.m.
https://www.beavercreeknewscurrent.com/wp-content/uploads/sites/49/2018/08/web1_balloonglow-1.jpgXenia Community Festival features a balloon glow. https://www.beavercreeknewscurrent.com/wp-content/uploads/sites/49/2018/08/web1_hallo4-1.jpgFairborn’s Halloween Festival attracts gouls and gobblins of all ages. https://www.beavercreeknewscurrent.com/wp-content/uploads/sites/49/2018/08/web1_oldtimers-1.jpgFile photos Youth participate in old-fashioned contests during Old Timers Days. 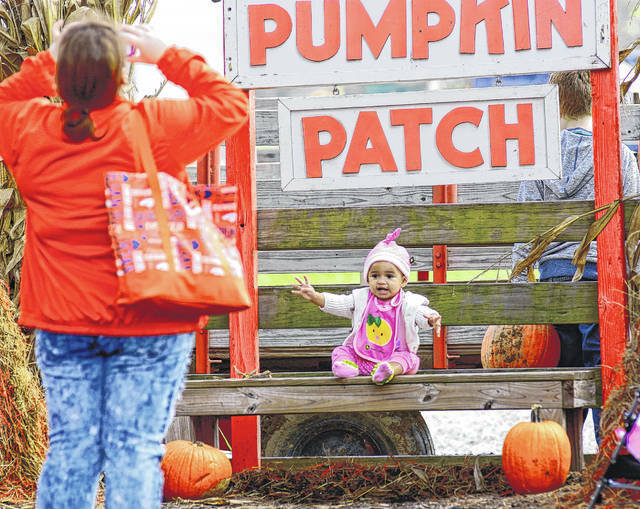 https://www.beavercreeknewscurrent.com/wp-content/uploads/sites/49/2018/08/web1_pumpkinpatch-1.jpgYoung’s Fall Farm Pumpkin Festival highlights all kinds of pumpkin activities and treats.